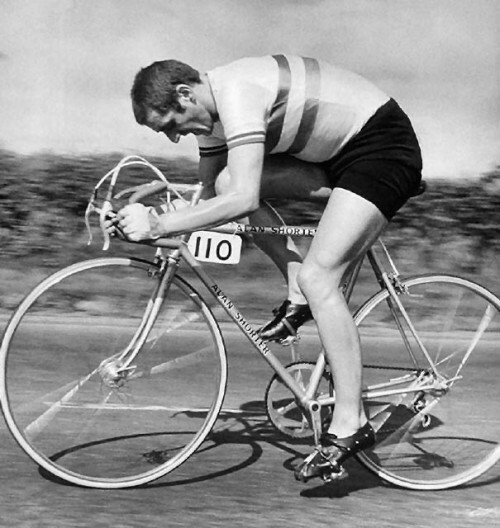 12 Champions by Peter Whitfield offers twelve different chapters on the great British cyclists of the post war period. It focuses on the domestic stars of both time trialling and road racing. I really enjoyed reading it, and is one of my favourite cycling books. It captures the best of British cycling during the post war period. It is a time when British cyclists rarely achieved much on a global or continental stage, but there was much more interest in purely domestic racing in those days. You get a feel for the times when huge crowds were drawn to watch a record attempt or even just see the stars of the road. As Roger Bannister noted when he presented the BAR awards in 1970s saying words to the effect – ‘Such enthusiasm I have never seen for any amateur sport’. Of course, we can look back on ‘the golden age’ with misty eyes as if everything was perfect. It wasn’t. There were absurd implementation of rules such as amateur vs professionals; there was still that ridiculous secrecy about racing. Yet, there were many things which really were great about this period. For example, there is a note that huge crowds turned up to see Eileen Sheridan break a record in the 1950s. The sad thing is the record was disallowed because the huge crowds were a sign that there had been ‘advance publicity’ something against RRA rules. But, it’s great that so many people got excited about the challenge of seeing whether the great champions could break a record. Sadly, traffic conditions have made these records of London-York, London-Edinburgh obsolete. But, in that era, these road race records were very high profile. Whitfield captures the essence of what made these diverse champions. Each rider is mostly given a sympathetic and lively portrait. Yes, the champions had their rivalries, their failings, but this is mainly a celebration of what they achieved. 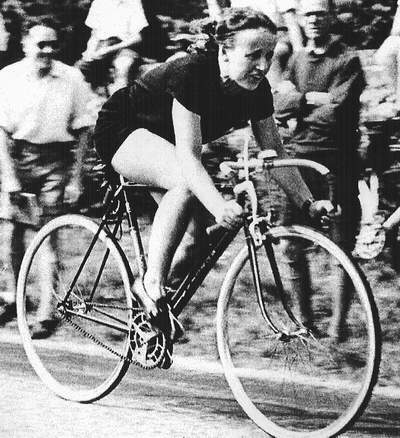 It is not hagiography, the results and achievements speak for themselves, and in the case of Beryl Burton – questions about the cost of dominating the sport for so long. Overall, I got a lot of inspiration from the book. It raises many interesting questions and gives a lot of inspiration for those who like the sport. Eileen Sheridan. The smiling record breaker. After dominating the domestic scene, Sheridan became a professional and proceeded to beat all the great road record associations. With her great talent and personality she was one of first women to make a good living from the sport. John Arnold and Albert Crimes – ‘two men, three wheels and a dozen records’. 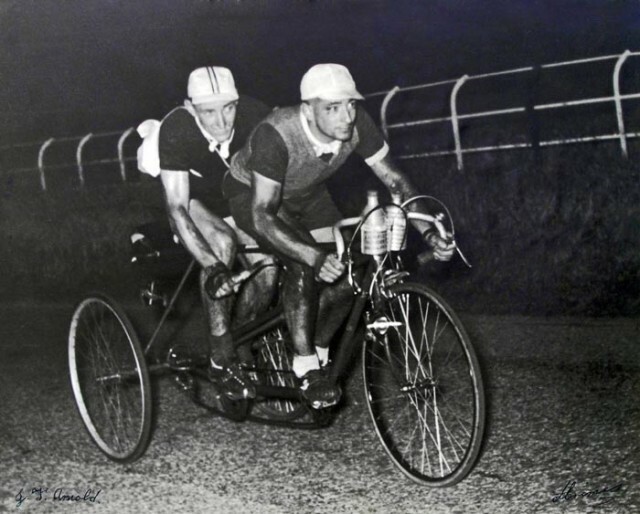 The record breaking tandem trike duo! What fascinated me about this chapter was the fact for the 1950 Land’s End to John o Groats record there were 500 people involved in the record attempt along the way. All organised the attempt using public phone boxes and telegrams. The expensive aluminium bottles even had their addresses on to be returned by post. Ray Booty was the first sub 4 hour 100 mile. 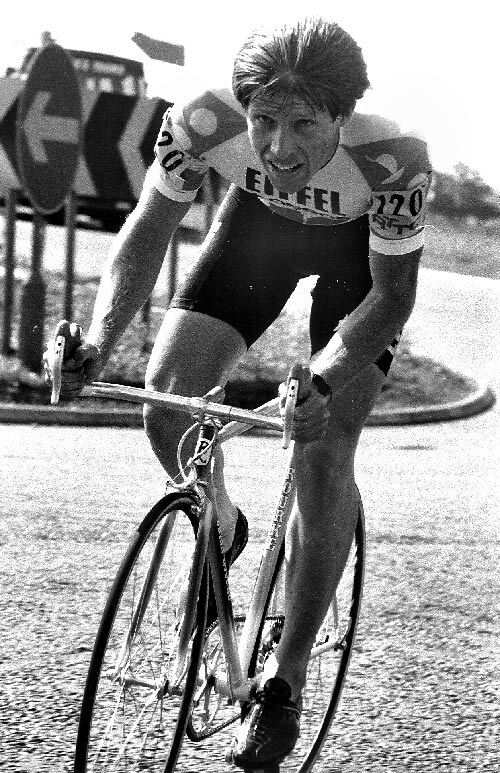 As Whitfield notes, this is one of the most iconic cycling records – more so than the first sub 1 hour 25 and first sub 2 hours 50. Booty was already a legend of the domestic time trialling scene. 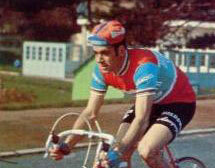 His ride on the Bath Road 100, smashed the record and it stayed unbeaten from many years. In many ways, Booty’s ride came from the golden era of timetrialling. 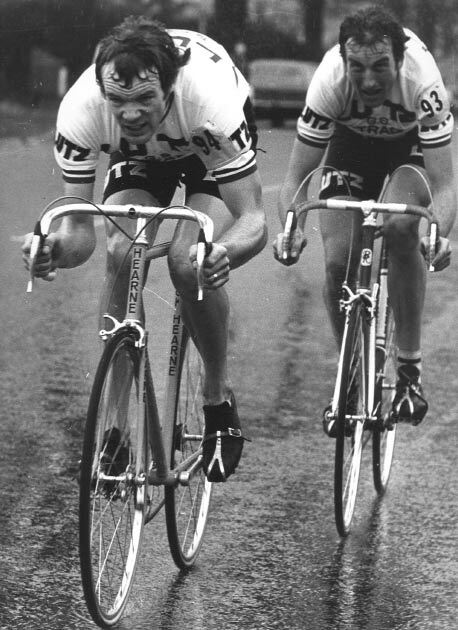 The days before heavy traffic and the days when the great time triallists really were the stars of the domestic season. Frank Colden. ‘The Great Experiment’ Frank Colden’s story is the most inspiring, enigmatic and puzzling of all the 12 champions. Coming from nowhere, Cobden, in secret, rode 400 miles a week during a cold winter. He came out of this winter block with supreme form and smashed national records and in 1962 swept the floor of the national championships. His record breaking season was even more enigmatic because it co-coincided with the onset of an illness which meant he disappeared from the scene. Even now, the achievements of Colden in that 1962 season spark debate. Martyn Roach – An outspoken traditionalist, who excelled in both road racing and timetrialling. A keen advocate of national championships and critical of the ultra-fast BBAR courses. Phil Griffiths. ‘Bringing showbiz to cycling’. 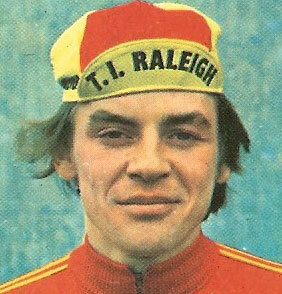 The great talent who was at ease in both time trialling and road racing. Sid Barras. A star of 1970s British road racing, he won over 200 races, making himself a well paid star. Even showed signs he could have mixed with the European greats. 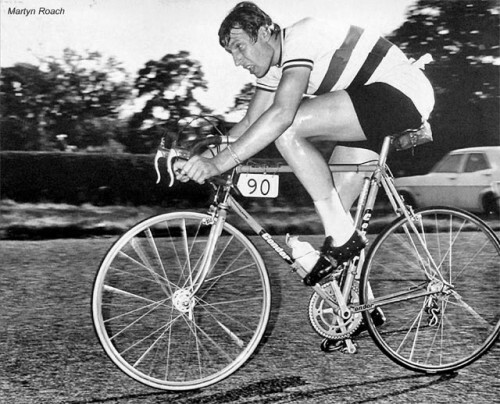 Alf Engers. ‘ The King’ Engers name pops up in timetrialling circles with great regularity. The ‘bad boy’ of timetrialling, Engers had frequent run ins with the RTTC officials, but he also lit up the time trialling scene with epic performances at 25 miles. Engers really gave some glamour to the ‘blue ribband’ of domestic time trialling and finally posted the first sub 50 minute 25 mile TT. Ian Cammish. Another legendary star of timetrialling. Cammish took the 100 mile and 50 mile records and put them on the shelf – until the revolution of aerobars e.t.c. 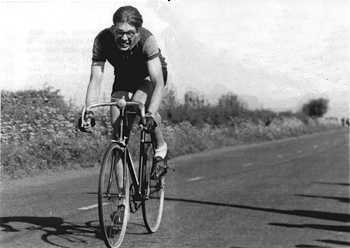 Cammish trained 3 or 4 times a day, short intense rides – which gave him tremendous speed at 100 and 50 miles. Ian Cammish won the BBAR throughout the 1980s. He still races today, though not as frequently. Some riders I had already heard about, but I was glad to fill in the many gaps. Some I barely knew (Sheridan, Cobden) but I was glad to be acquainted. The only thing about 12 champions is I would have loved for the book to be bigger. More champions like Webster, Lloyd, and the recent stars like Hutchinson, Dangerfield, Obree, Boardman and Andy Wilkinson. This is a short comment the like of which you are unlikely, I suspect, to receive again. 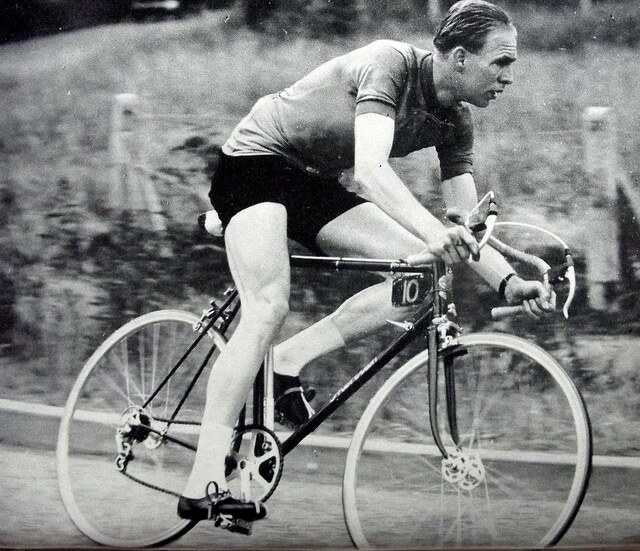 I was scanning the pages of photographs in your book “Cycling Uphill”, and discovered a photo of Frank Colden, a well know Time Trial rider whom I had the privilege of knowing in 1962. I was, in fact, present on the Bath Road to cheer him on when he road his epic 100 and thrashed the then existing TT record beating the clock to finish under four hours. I am confused to see that your book marks Ray Booty–too early for me–as the holder of that record. This is in no way a criticism of your work, which I enjoyed reading considerably, but I would be very interested to know if there is a misconception somewhere concerning Frank’s record. I now live in British Columbia, Canada, and I gave up competitive cycling when I came to came to Canada in 1966, and stayed. 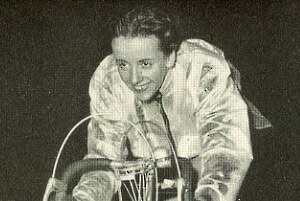 In my time trial days, I rode many times with Beryl Burton on the starting list. Like many others, I was a fan of Beryl’s and was honoured to compete in many of the same events with her. I rode with Middlesex Road Club and with Weybridge Wheelers, as a touring member. I won the Rosslyn Ladies hundred and was happy as well as exhausted, to go under five hours. 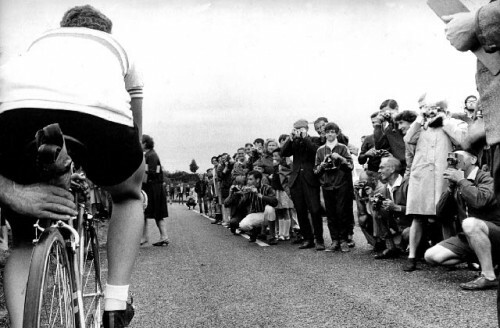 Personal best for a 25 was doing 1:05. on the Southend arterial road–a morning when Beryl went under the hour.